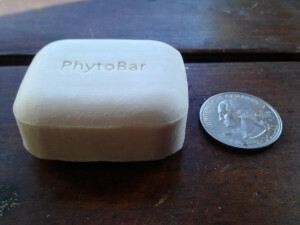 This Lelan Vital Phyto Soap Bar is for real. Super Expansive, Super Good. Let me start by saying that the sales person who sold me this soap was not lying when she said it will last a long time*. This soap will cost you about $10 an ounce. That means your regular bar of about 3.5 ounces would cost you $35. *Fortunately you will only use this soap on your face (unless price is no matter to you then I say, “use it all over your body”). This soap was designed to last a long time. Super hard (dense) soap that foams up like nothing you have ever tried before. Instant thick, foamy suds. When you wash your face with this soap you will feel that there is a pillow of foam between your hands and face. The scent will keep you wondering. It smells like concentrates of super hyper phyto active good for you plants, almost very medicinal like but all natural. If you are acne prone this soap apparently can do wonders for that as well. Also check out the ingredients in this little bad boy of a soap. Cost: $12.00 for 1oz. bar in box or $5.00 for 1/2 oz. Characteristics: Small in size, big in cleanliness. Ingredients: Cocos Nucifera Oil, Rhodiola Rosea Root Extract, Undaria Pinnatifida Extract, Mineral Salts, Hydrogenated Jojoba Oil, Angelica Archangelica Root Extract, Chamomilla Recutita Flower Extract, Glycerin, Ampelopsis Japonica Root Extract, Bletia Hyacinthina Bulb Extract, Phaseolus Vulgaris Seed Extract, Coix lacryma-Jobi Ma-Yeun Seed Extract, Artemisia Princeps Leaf Extract, Sophora Flavescens Root Extract, Silkworm Extract, Ginkgo Biloba Leaf Extract, Ulmus Davidiana Root Extract, Mentha Arvensis Leaf Extract, Phaseolus Radiatus Extract, Cnidium Officinale Root Extract, Aloe Barbadensis Leaf Extract, Vitis Vinifera Seed Extract, Tocopherol, Acorus Gramineus Root/Stem Extract, Prunus Armeniaca Kernel Extract, Melaleuca Alternifolia Extract. Where can buy it？Cosway didnt sell it anymore.